Free Audio to flash converter is a powerful tool which specializes in converting audio files to flash files for free. This free tool creates flash flies from audio files, and keeps prepared for your website. Supports multiple Input file formats including *.ac3,*.aac, *.amr, *.aiff, *.au,*.ape, *.m4a,*.flac,*.mka,*.m4b, *.mp3, , *.ogg, *.ra, *.mpc *.ram, *.tta, *.spx, *.wma*,*.wav. Free Audio To Flash Converter is free from malware and adware. The software allows to choose different functions and colors. You can add favorite buttons like stop, play, pause, seek bar, next, previous to your Flash MP3 player. It’s clearly free, absolutely safe, and secure to use. Automatically generates the code, allows to copy and paste anywhere you require the Flash MP3 audio player to be appeared on any of your web page. Safe and handy tool to use. Show HTML file after conversion. Choose different functions and colors. Automatically generates the code and allows to copy and paste the link. Free from adware and malware. Also, check out our post on Windows 8 Software to Remove Unwanted Software. Click over to the “Download Now” button. Execute the downloaded setup to your PC. Proceed on with further on screen steps to complete the Software’s installation. Free Audio To Flash Converter is a remarkable tool to convert audio files to FLV files and makes ready for your Website. 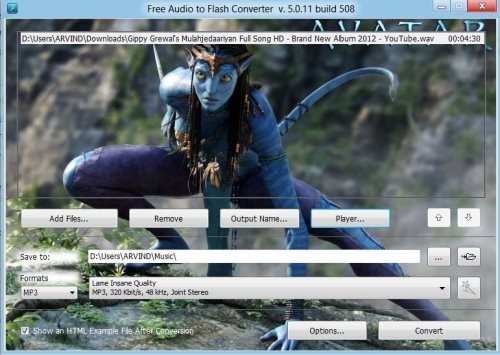 Give a trial to this Free Audio To Flash Converter.